November 2 was Dia de los Muertos (Day of the Dead) and the whole family got dressed up for a big procession in San Francisco’s Mission neighborhood. 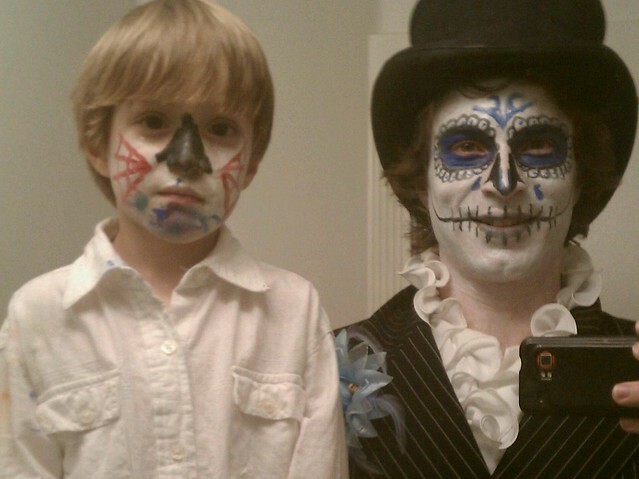 Lots of people where black and white for the occasion and paint their faces like skeletons. I learned that it’s a time to honor the dead. And I also learned about doing my own makeup! Papa got a bunch of makeup supplies and started doing his own makeup. He was looking at pictures of different makeup design and using those to create his own idea of what to paint. So I looked at the pictures too and made up my own design. I asked Papa to help with a couple parts, but I did it mostly by myself! It included a spider, spider web, white face and black nose. The procession was a bit late for me and I ended up sleeping through it, but I had a great time getting ready with everyone and learning about Dia de los Muertos.